Bay Area News Project: Please, God, let it not be boring. So the big news today out here is that after months of speculation, Warren Hellman, the patron saint of the Best. Festival. In. San Francisco. Ever. is plunking down $5 million to seed the creation of what’s being called the Bay Area News Project, a journalism outfit that’ll be linked with KQED public radio and television, UC Berkeley’s J-School, and it looks like The New York Times. Alan Mutter has the best summary of the deal, and Dave Cohn just put up a smart post about what he hopes Hellman’s project does. Lots of details still to be worked out, so I think it’s way too early to say much more than that I’m really hoping this works out. Okay, that having been said, I’ve got a couple more things to say. Finally, a local news project at scale. Mutter’s right: this is probably the first local news project that is being funded at a scale where it really can have an impact. 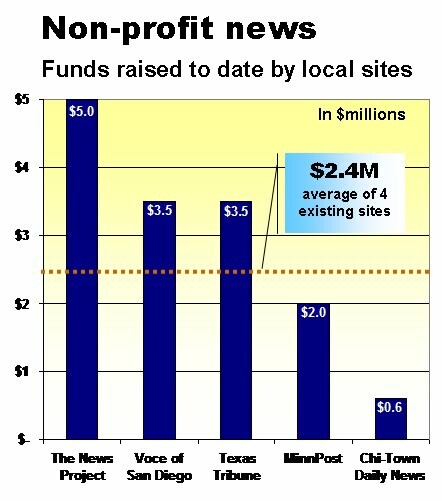 Here’s a chart from Alan’s blog, which compares the Bay Area News Project to local news operations in San Diego, Chicago, Minneapolis, and Texas. If, as seems likely, Hellman and his team go after additional Bay Area philanthropic support, then we are probably talking about a $10 to $15 million a year operation. (For comparison, MoJo’s a $9 to $10 mill shop, with about 50 people working here including paid interns.) So this is serious money. This is a genuine disruptive intervention in the regional news scene. For one, the scale at which this project will be operating has just upended the equilibrium of the Bay Area news scene. Executives at the SF Chron have been staying on message with weasel words about how much the paper and its website SFGate.com have improved of late, but that’s what you’d expect them to say. In private, no doubt the newspaper guys are looking at the Bay Area News Project with real worry. And based on some conversations with folks working in the “new news” media space today, they’re as unclear about what the future will bring as the rest of us – a sure sign that the rules of the ballgame just changed. But that’s not the only – or maybe the main – disruptive moment in play now. The alliance between a new news shop, a public university, a first tier public radio and TV station, and a national newspaper that’s made it clear it wants in to this market completely rejiggers our thinking about what a daily news “paper” is all about. Put another way, I really hope that the folks at KQED see this as the crown jewel of their future network. After so many years of opinion-based talk radio and feeder content from the national network, a smart, top notch local news shop that not only goes head to head with the papers but the lost cause that is TV and radio news would be an amazing thing. So if it’s done right, we’ll be seeing a situation where a collaborative network will be competing against traditional news shops. That’s going to be something to witness. I think Digidave is exactly right on this one. If the Bay Area News Project just tries to compete with the Chron, it’ll be such a missed opportunity. Or if its managers end up thinking their audience is the same as KQED’s or the Times. Or if it doesn’t extend its recruitment beyond laid off newspaper folk, or it doesn’t integrate distributed “citizen” reporting in a smart way. The News Project folks are talking about collaboration, but that’s not easy stuff to do – even though the payoff would be astonishing, so the jury’s out on this one. Yes, this is a lot to ask. But why plunk down $5 million bucks and not expect the a truly game-changing best effort? Please God, let it not be boring. There, I said it. Here’s the thing: could Warren and his gang build the Bay Area News Project on the stuff that really distinguishes Bay Area journalism from the rest of the country? That would really establish the Bay Area News Project as something that folks in this region would really want to “own” – not just as donating members, but as citizens of an amazing part of the universe? Well, think about it: this is the home of some of the best, push-the-envelope journalism this country has ever seen. Warren Hinkle and Robert Scheer and the whole Ramparts crew. Jann Wenner and Rolling Stone before it migrated east and went all corporate. Stewart Brand, Kevin Kelly, Peter Warshall and the amazing people who somehow put out Coevolution Quarterly/Whole Earth Review on a shoestring, started up The Well – and changed American culture in ways we still don’t understand. The weeklies in their heyday – the Bay Guardian and East Bay Express – who helped define the politics of a generation. Wired, which saw beyond the hardware and pocket protectors to the amazing drama that technology change introduces into our culture, and Salon, which has some of the consistently great online journalism around. And my own home base, Mother Jones, which at its best is a continuing rebuke to the commercial media’s failures. And when we switch over to the airwaves, holy cow: Pacifica before it imploded? Or KMPX and KSAN back in the day? Or (getting a little farther afield) KPIG? KKCY back before Jim Gabbert tore it to shreds? Scoop Nisker on KFOG?Combine all this with the Bay Area cast as the main character in the digital drama of the past forty years – not just Facebook and Twitter, but the whole thing – you get the picture. You probably have your own candidates for The Places That Define Bay Area Journalism and Media (somebody please fill in the historical blank in my knowledge of ethnic media, please! ), but you get the point: this is a place where journalists and media workers have a history of pushing hard against convention. They’re an opinionated lot. They live out on the edge. They have real voices and passions. They’re amazing storytellers. They irritate the hell out of people. They changed the world. That’s one hell of a legacy. It would make for an amazing daily read, wouldn’t it? Hell, I’d even pay for that. This entry was posted on	25 September 2009 at 4:49 PM	and is filed under Journalism, Media crit. I’m also following this with interest. Would also add California Watch, which Louis Freedberg is ramping up in conjunction with the Center for Investigative Journalism, another by-product of the muckraking revival here in the 60s and 70s. For those interested, I’m putting together a series of talks for the Osher Lifelong Learning Institute through UC Berkeley. We’ll quickly survey alternative journalism in California, 1939 to the present. I’ll invite guest speakers on such topics as Carey McWilliams (who eventually edited The Nation for 20 years), KPFA, Ramparts, Mother Jones, Daily Kos, etc. Starts in January. Hi all, we found this here when i did a fast yahoo search. Neat blog you got here! Keep it up!